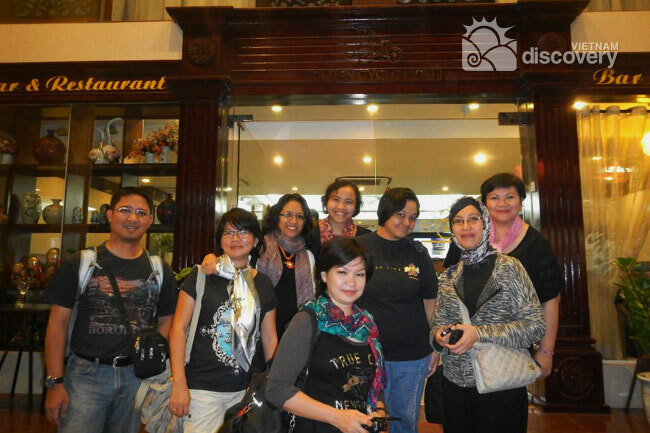 "Thank you for the Vietnam Discovery who already arrange our trip to Vietnam. The customer service staff always gave prompt response to our inquiries ... Thank you Vietnam Discovery for arranged our Trip. It was a pleasure for us. 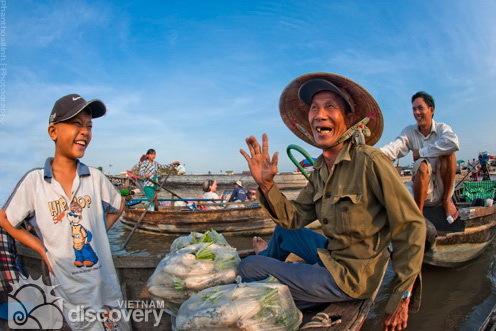 We definitely recommend Vietnam Discovery for your trip to Vietnam." This is what our valued clients gave feedback to us on TripAdvisor. The photo was taken in front the Golden Cyclo Hotel in Hanoi. Hanoi is most beautiful in autumn. And Hanoi autumn is sweetest with the fragrant Hoa Sua. Tens of thousands people are flocking to city streets to see and smell the kind of flower that signals the arrival of autumn. Hoa Sua is literarily a classic theme, written and sung about in poetry and song. Enjoying the city streets lined with the milk flower in full bloom is truly a delight, creating the perfect romantic setting for boys and girls on a date. 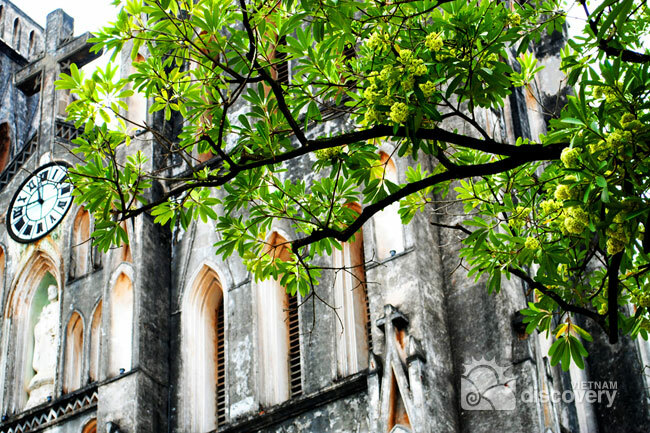 For foreigners visiting Hanoi in autumn, they are also impressed by Hoa Sua when walking along the streets of Hanoi. The Mekong delta holidays offers you great chance to meet and talk to local people, who are said to be very friendly, hospital and industrious. The photo caught the happy moment of two people: a young boy and an old man in Cai Rang Floating Market. Let's travel to the Mekong delta to visit its floating markets, lush orchards as well as to make friends with simple but lovely people. It would be your great experience when traveling to Vietnam! 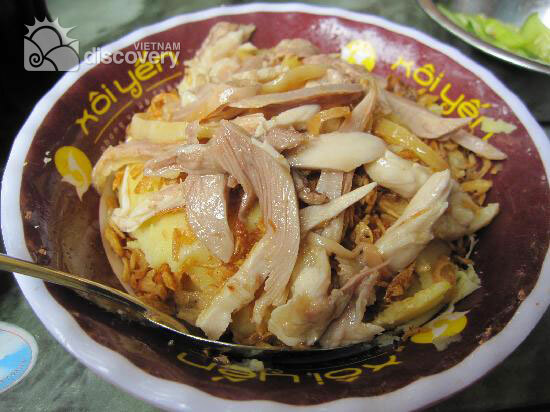 It’s impossible not to mention Yen’s sticky rice whenever talking about simple dishes in Hanoi. Nguyen Huu Huan Street is the first place in Hanoi serving sticky rice with steamed pork, fried eggs, pate, sausage and chicken to create a unique flavor. You can choose from a wide variety of sticky rice served with many salty dishes. “Xoi Yen” has been famous for nearly 20 years owing to the careful oversight of its owner. A portion of sticky rice costs about 40.000 VND. A dish of the Vietnamese countryside has become a brand name. 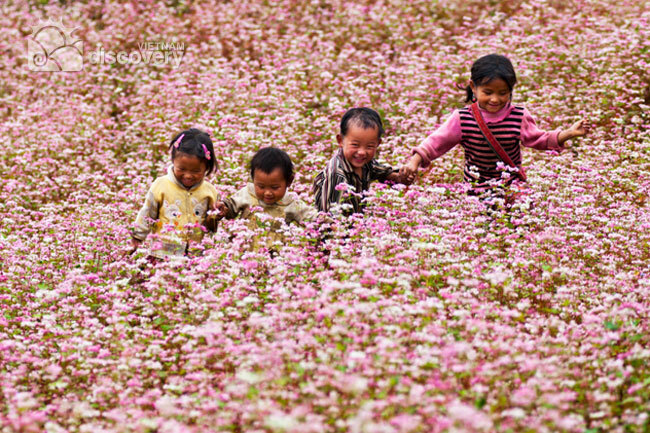 For backpackers and photographers who have passionate for Tam Giac Mach flower in Ha Giang, autumn is the best time to flock to this northwest mountainous region to admire blooming Tam Giac Mach Flower fields. Although you can see Tam Giac Mach in Lao Cai, Cao Bang and Ha Giang, these flowers in Ha Giang are planted much and most beautiful. It bloom and have the most beautiful color in the late fall the month of November. Time’s not waiting, prepare your luggage and travel to Ha Giang to enjoy the beautiful flowers! Vietnamese people are known for our friendliness and hospitality to foreign friends all over the world. Also, we are appreciated to be optimistic ones despite being hard with the daily works. 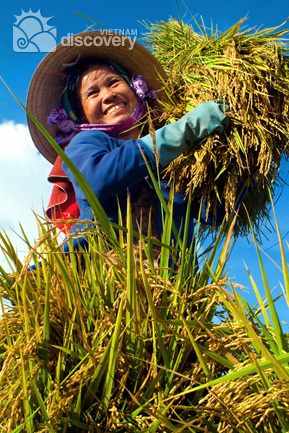 In the photo, you can see the brilliant smile of a farmer who is harvesting rices to take to her home. Although she has to working hard at the field, she is happy so much for the main crop more abundant than usual. 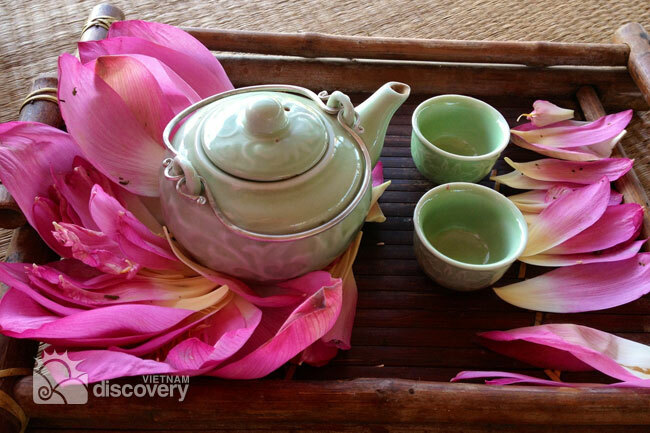 Vietnamese lotus tea (Che Sen) is a type of green tea produced in Vietnam that has been flavored with the scent of Lotus flowers. It is a specialty product of the Vietnamese tea industry and is consumed as part of celebratory events or festivals. If you have chance to visit Hanoi in summer, you're highly recommended to wait for the sunrise over the West Lake and then enjoy a cup of lotus tea served right at the lake. A worthy experience for most foreigners to Hanoi! The photo was taken by our staff Linda Pham at Chef Mai's home. In this photo, our client, Steven King, was practicing to roll the fresh spring roll rice paper. After the tour, he expressed his admiration to the knowledgeable our talented Chef Mai and also appreciated us for our good service. 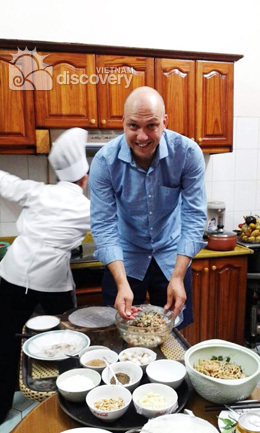 Moreover, he enjoyed every Vietnamese meal cooked by Chef Mai and was impressed by the meal with Chef Mai's family. The harvesting season is coming to the Hanoi suburb. 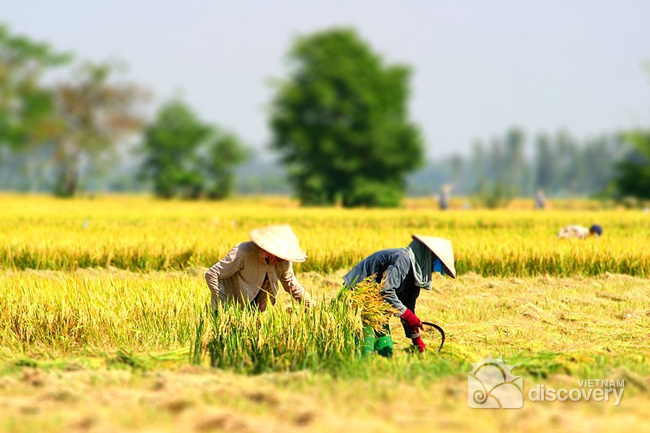 Let's give yourself one chance to become a real Vietnamese farmer working in the Northern rice fields in our Harvesting day tour in Hanoi suburb. Remember that we only limit 8 pax per group, therefore, first come first served. Also, one important thing is that the harvesting season only lasts for 2 weeks until now. Hurry up to catch the once-in-year opportunity! Com Hen Song Huong (the Mussel Rice in Huong River) is regarded as the most famous Hue specialty. Though Mussel Rice is the very simple and low-price specialty of Hue, it possesses a complicated recipe of sweet, buttery, salty, sour, bitter and spicy flavors. 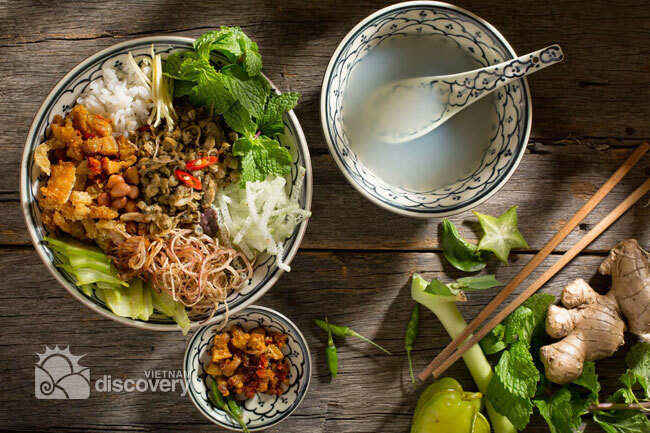 When tasting this special kind of food, tourists can experience the simplicity and deliciousness of traditional Vietnamese cuisine. There’s a most common saying for those who traveling to Hue: “Visiting Hue, you could not miss Mussel rice in Huong River, or else you have not come to Hue ever”. 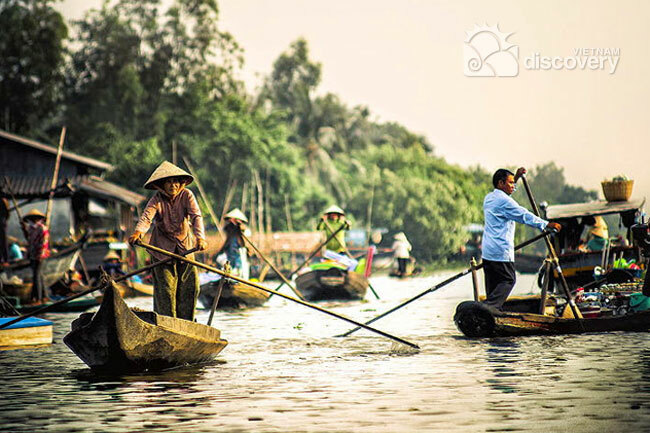 If you have chance to travel to Southern Vietnam, you cannot miss the destination of Mekong delta, where the locals' life is attached to the river. As you can see in this photo, the daily life of Mekong people on the morning floating market. No trip to Sapa would be perfect without discovering the flavor of Thang Co, a specialty of the H'Mong ethnic minority. The traditional main ingredient of this dish is horsemeat; nevertheless, ethnic local cooks Thang Co by using buffalo, cow or pork. Remember to take one bowl of Thang Co to taste the unique cuisine culture of the H'Mong people whenever you have chance to visit Sapa. 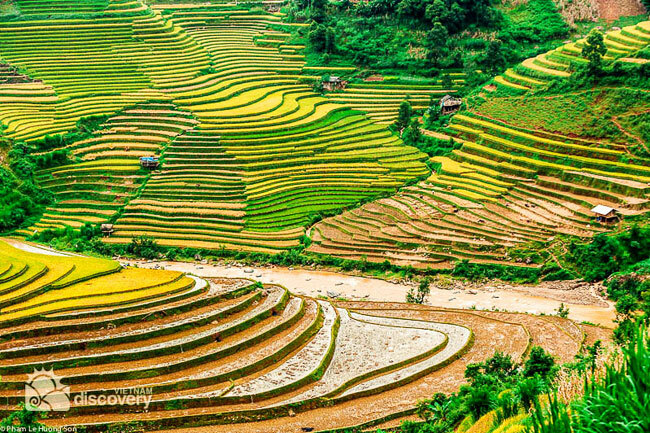 Sapa terraces were listed in Top 7 most beautiful and spectacular ones all over the world. 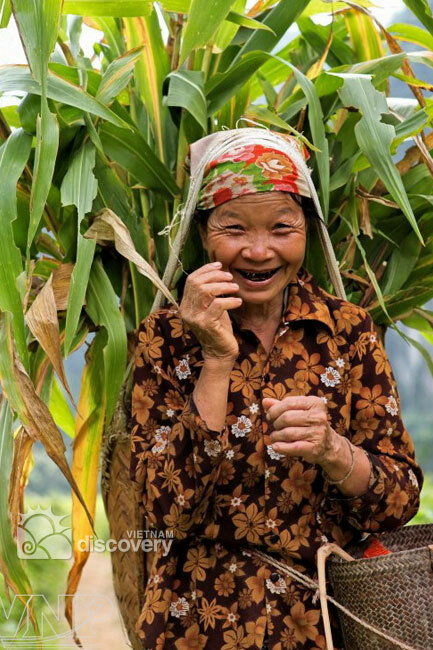 It is regarded as the creation of Vietnamese ethnic minority people, who have been living in the Northwest mountainous area for many generations. 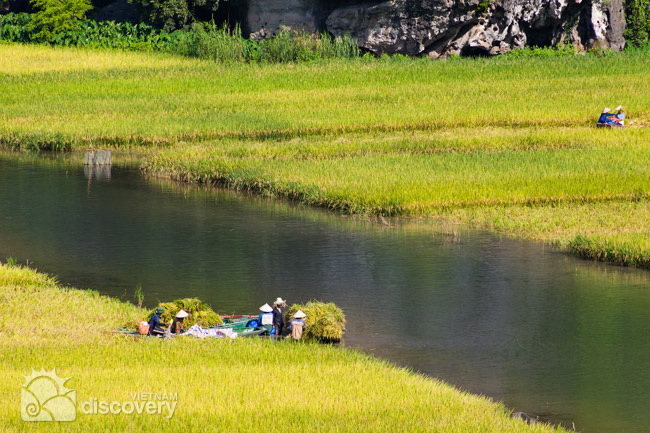 During a trip in Sapa, you will have chance to admire the unique natural beauty of numerous stunning terrace fields. 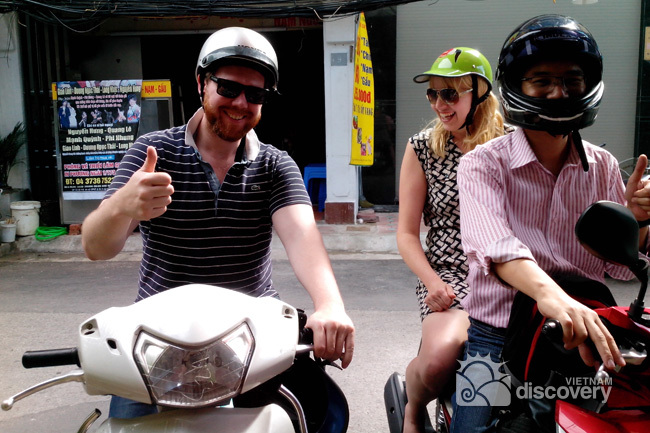 Hanoi half-day tour on motorbike is one of our best-seller tour, which has been a good choice for foreign tourists to explore the Hanoi's Old Quarter on motorbike. Matt and Tanya are two of our value clients, who had experienced the half-day tour in late 2013. You can see how satisfied they were when they rode on our motorbike and explore Hanoi capital. 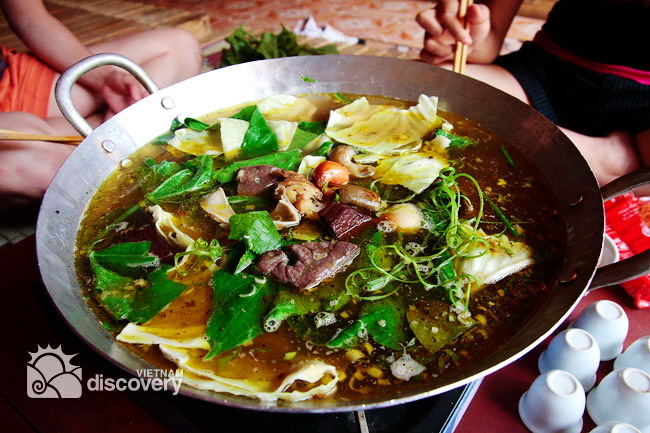 If you are passionate on Vietnamese cuisine, why don’t you join us in Gourmet Vietnam Tour and enjoy a great offer: Each online full successful payment of the tour within the promotion time from June 2nd to June 30th, 2014. Coming to Pu Luong Nature Reserve whose culture identities seem to be well preserved for generations, visitors cannot miss the chance to talk with the friendly locals and further learn about their unique culture. Tam Coc (The Three Caves) is one of the popular destination in the northern province of Ninh Binh and has become an ideal place for a short trip from Hanoi. The beauty of Tam Coc is said to capture every visitor's heart at first sight, especially during the time of harvest season. You can admire the sparkling yellow of rice fields on the way rowing boat on Ngo Dong River. Vietnam Discovery Travel would like to offer you our great promotion package “More pax, huge savings for Best tours of the year”. Accordingly, you will save $20 for each pax in group from the 2nd pax & onward. The special deal starts on May 1st and ends on June 1st. Vietnam Discovery Travel starts the summer promotion packaged named "Hot Deal to heat your summer" from April 1st to 20th, 2014. During the period time, each online full successful payment of the Vietnam at a Glance Luxury tour will be charged at a three-star-rate for a five-star-cruise (equivalent to be OFF 5% on total cost).